A live chat solution for people who can’t sit and chat all day. TextChat is free up to 50 conversations per month. A live chat solution for bustling businesses and active customers alike. 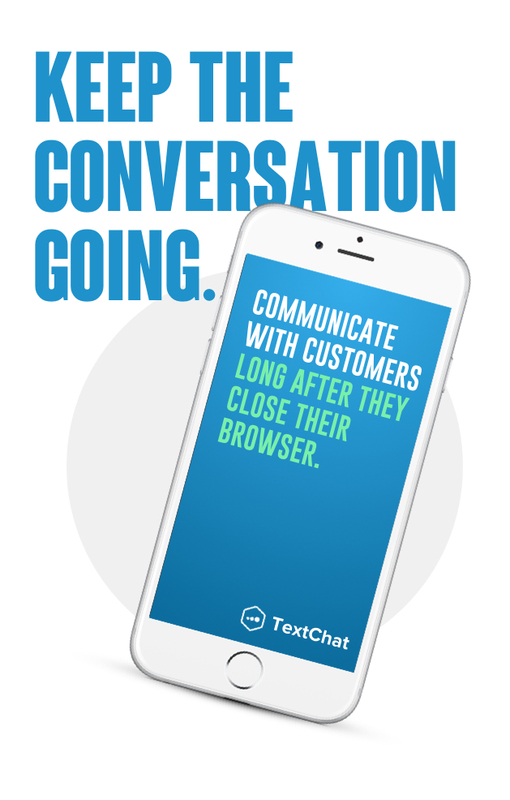 TextChat shifts communication from a browser to a text message so that conversations last longer, sales go up and customers come back. Traditional live chat leaves users shackled to their browser, growing more impatient by the second. TextChat lets visitors go on with their lives, transferring the chat from the browser to their phone. Once the conversation is complete, take TextChat to the next level by using it as a marketing tool. Text messages have one of the highest ROI’s of any marketing platform available! Many small business owners can’t sit by the computer, waiting for chats to come in. With TextChat, the power to respond moves with you as you help customers, stock shelves and ship orders. Website visitors that engage with live chat are worth 4.5X more than those that don’t. Why would you want to let even one of them get away? Get potential customers the right answers in the right way and close more sales. Customers who live chat with your brand are worth 4.5X more, but most will bail within two minutes. Chats start online, but continue offline. The TextChat Widget allows website visitors to chat in from a desktop (or mobile phone) and then transfers the conversation to their cell phone. After chatting in, they can stay and browse or leave their computer — the conversation still goes on even after the customer leaves your site! Keep a pulse on your customer communication within the TextChat Management Portal. Reply to questions, snooze conversations for later follow-up and track response and performance metrics from the Dashboard. Once the conversation is complete, invite your customers to sign up for deals and announcements. Most businesses find that up to 80% of their customers will opt in. The TextChat app gives you freedom to go about your day, knowing that you won’t miss out on valuable conversations when you leave your computer behind to, you know, run a business. Set up Auto-Replies to automate responses to frequently asked questions, or provide a predetermined response based on the time of day or day of the week that the customer writes in. Set up simple automations to ask customers if they’d like to receive updates and promotions from your business. Those who do will be automatically placed on your text marketing list. 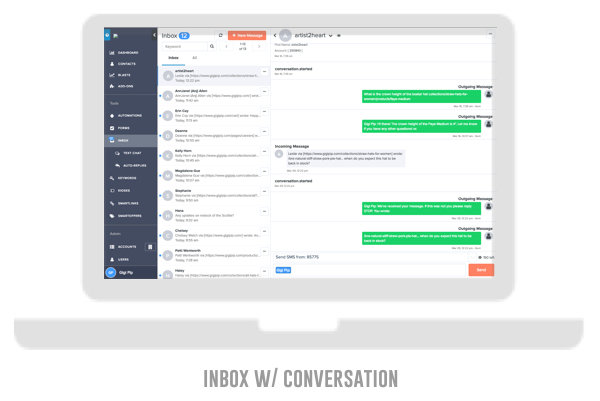 Want to clean out the inbox but worried about following up with customers? The TextChat “Snooze” feature allows you to temporarily archive conversations until you want to follow up with them again. It’s essential to having a clean inbox. 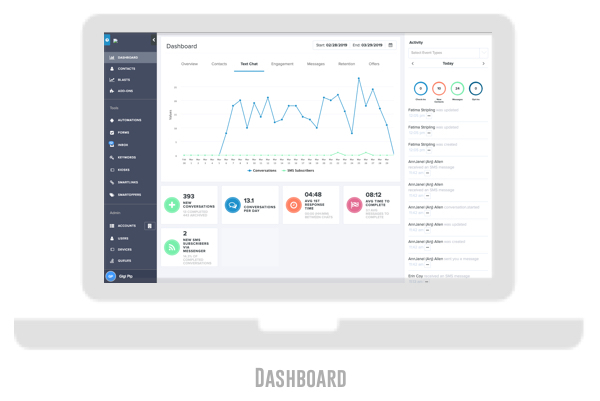 The Analytics Dashboard helps you manage your conversations and provides insights like your average first response time, average conversations per day and how many contacts accept marketing messages. Capture customer attention with call-outs. These are quick messages that appear above your TextChat widget at a time interval that you decide. 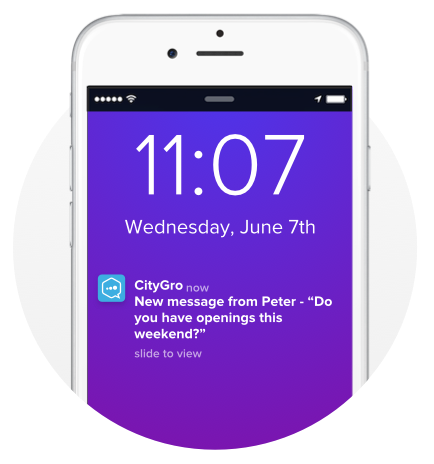 The After Hours feature allows you to change your instant reply based on your work hours. This helps set clear expectations for your customers, letting them know when they can expect a response. Can I add TextChat to any website? Yes, TextChat can be added to any website as long as you have permissions to add the Widget Code to your header or footer. TextChat is free up to 50 conversations per month. If you exceed 50 conversations in a month, you have a few options. Take a look at the graphic below and shoot us a text if you have any questions. What is considered a conversation? Can I use my current business phone number? Can I text contacts for marketing purposes? Yes, but only if you have their consent. Receiving their phone number from an asked question does not in itself provide consent. Many companies set up an automated message that goes out after a conversation is resolved, asking the customer if they’d like to sign up for announcements and relevant promotions. Up to 80% of customers will agree!